Google Search Comes To Windows Phone Via IE9. Offers Pin To Start. It’s not frequent that we get to see Google spreading their love in creating apps for Windows Phone. Users on the platform uses Bing and it’s not like that have a choice. Guess what? The big guys from Google has found its way to the start screen on the Windows Phone! Use the IE9 browser on the Windows Phone and navigate to Google.com and you will be prompted to pin Google to the start screen. 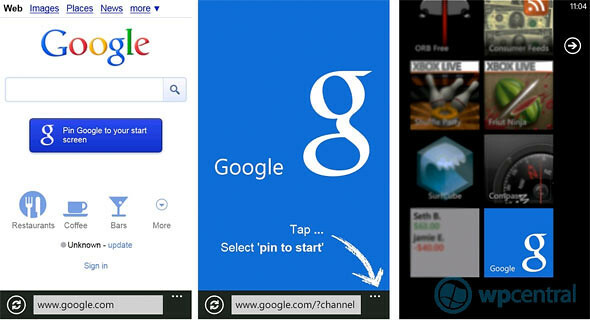 Tapping it will bring up a blue screen with a big Google logo and an arrow asking users to tap on options > Pin to start. Google Search will now become a shortcut and a simple tap will allow users to go direct to Google.com. Try it!